Happy Birthday: You’re Gonna Die! Having spent a couple of frightening years as an insurance agent, I can say, without a doubt, that I am 100% satisfied with my current insurance company. Their rates, coupled with their customer service and corporate ethics, are seemingly unrivaled. HOWEVER, they need to stop sending me the postcard that reads, “Hey, you’ve got a birthday coming up! 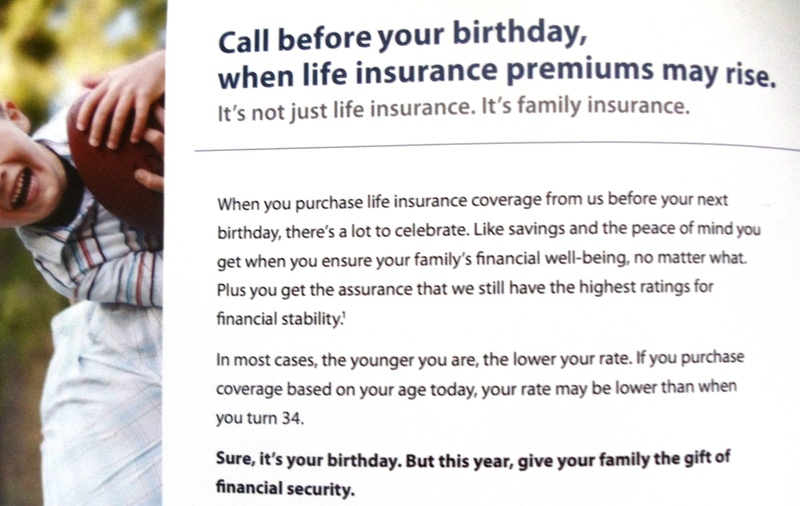 You might want to think about getting that life insurance soon, while it’s still somewhat affordable for you to do so…hag.” Every year. For real. Just stop. Hurry! Before you DIE and we can’t collect any premium from you! And since when did it become okay to call a lady out on her age! Did you see that? The “34” in there. Clearly a typo! I understand the importance of life insurance. I truly do. I also understand, having worked in the industry, what a huge money-maker a life policy is for an insurance company, and the push that exists to accumulate them. But, reminding a woman that she’s ever closer to tea time with the Reaper, and attempting to impart the urgency of her purchasing a policy by informing her that her rates will only increase upon her next birthday – because she is that much closer to DEATH – is a brand of marketing genius well beyond my rapidly aging brain’s capacity to comprehend. I can only imagine the message waiting for me in next year’s postcard. Since you’ll be turning 35 this year, and since you’ve yet to purchase a life policy, it’s obvious you’re exhibiting signs of early dementia. But, never fear, it’s not too late to protect your family from both your old-womany-stubbornness and your overall accelerated decay. This entry was posted in aging, rat bastards, women and tagged aging, humor, insurance, women on April 17, 2011 by Niki.